In collaboration with Lenny Kravitz – the musician, actor and designer– Leica Camera AG, Wetzlar, presents a special camera edition set: the LEICA M-P ‘CORRESPONDENT’ BY LENNY KRAVITZ FOR KRAVITZ DESIGN. The edition comprises a Leica M-P digital rangefinder camera and two fast classics from the range of Leica lenses – the Leica Summicron-M 35 mm f/2 ASPH. and the Leica Summilux-M /50 mm f/1.4 ASPH. – delivered as a set in a bespoke case. The special edition is strictly limited to 125 sets worldwide and will be available from March 2015. Leica’s collaboration with Lenny Kravitz was born out of the artist’s passion for photography. The first camera Kravitz ever used was his father’s Leicaflex which he received at age 21, as a gift from his father. 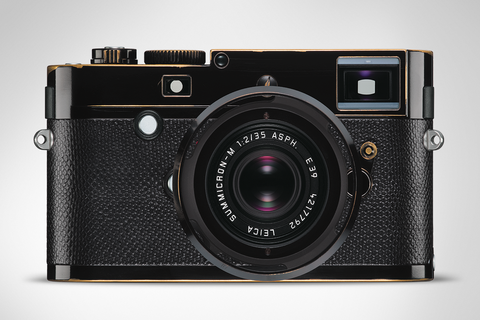 The unique, distinctive design of the LEICA M-P ‘CORRESPONDENT’ BY LENNY KRAVITZ FOR KRAVITZ DESIGN set was created in reminiscence of this beautifully aged Leica camera. For instance, the glossy black enamel of the camera and the two lenses have been intentionally aged in homage to a well-used camera system, showing a distinctive patina that would usually point to many years of constant use. To achieve this look, every camera and lens of the edition was ‘aged’ entirely by hand to create absolutely unique individual products. Another characteristic feature of the edition sets is the unusual trim of the Leica M-P cameras in the finest-quality yet very durable snakeskin – naturally from controlled sources that are not subject to species conservation regulations. This material in premium glossy black is also used for the camera strap and wrist strap that are included in the sets. The LEICA M-P ‘CORRESPONDENT’ BY LENNY KRAVITZ FOR KRAVITZ DESIGN set is stylishly complemented by a custom case handmade in Germany specially for this edition. The custom case picks up the product design theme and is covered with the same material as the camera. A particularly interesting feature of the set is the special version of the Leica Summilux-M 50 mm f/1.4 ASPH. This lens has been constructed in the classic design of its ancestor from 1959 and reflects the typical features of its predecessor – for instance, the scalloped focusing ring and a finely knurled aperture ring. The camera and lenses of the LEICA M-P ‘CORRESPONDENT’ BY LENNY KRAVITZ FOR KRAVITZ DESIGN set are otherwise identical to their series production equivalents in performance and technical specifications. The Leica M-P offers all the technical advantages of the Leica digital rangefinder system cameras and possesses the same enduring and robust qualities for which the Leica M-System is renowned. In the case of the two Leica lenses, their essential properties include superior optical performance and extreme versatility. A book of Lenny’s photography entitled Flash will be published by teNeues Verlag and available for purchase from March 15, 2015. Kravitz’s photography offers unusual insights into the nomadic life of a musician ‘on the road’. In addition to being distributed by the publishers, teNeues Verlag, the book will also be offered for sale by Leica Camera AG in Leica Stores and Leica Boutiques.